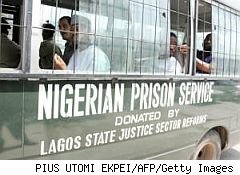 Ten alleged members of a Nigerian email scam crime ring have been indicted on federal charges of swindling at least two dozen victims nationwide out of some $1.5 million, the U.S. Attorney for the Central District of California announced yesterday. Nigerian 419 scams -- the "419" referrers to a section of the Nigerian criminal code -- are a notorious kind of advance-fee fraud where con artists posing as foreign dignitaries send spam emails to victims offering them a huge payoff in return for an upfront payment.The defendants are accused of running an advance-fee scam that targeted mostly elderly victims with false promises of millions of dollars in inheritances in return for advance fees to facilitate the transfer of the bogus bequests. The ringleader and lead defendant in the case, Claudio Uche Dibe, is a 25-year-old Nigerian. Dibe was extradited from Canada on Feb. 4, where he fled in 2009 after learning of the federal investigation. He was ordered held without bond after pleading not guilty last month. According to a 2009 indictment, Dibe coordinated the nationwide 419 scheme for several years, which bombarded thousands of potential victims with spam emails supposedly sent by someone with access to a multimillion dollar inheritance in Nigeria. The emails baited recipients with the opportunity to strike it rich in return for advance payments to cover trumped-up paperwork such as "anti-terrorist certificates," "certificates of insurance" and "drug clearance certificates." In order to convince victims of their legitimacy, the senders of the emails claimed to be attorneys, bankers, diplomats and other government officials. Dibe and his fellow con artists, the indictment alleges, ensnared their victims by asking only for small amounts of money at first. Once a consumer agreed to wire the scammers anywhere from a few hundred to a few thousand dollars, they were repeatedly asked to send increasingly larger amounts -- sometimes in the tens of thousands of dollars. The 419 scammers eventually fleeced their victims out of more than $1.5 million. A 2010 indictment that named other members of the ring includes a number of telling emails, including one to Dibe from a member of the ring, complaining that one of their victims, "is insisting that he does not have more money, though I believe he will be able to come up with money ... I believe that ... he will pay big money, which is what we are all after." That email was sent on January 8, 2006, and the victim, a Michigan resident known as "T.S.," had already wired the gang $1,550 via Western Union on Dec. 20, 2005. On February 9, they persuaded T.S. to wire them an additional $1,500, and the hapless victim wired them another $1,750 on February 21 as well as $1,900 on May 4. Another email cited in the indictment refers to a victim from Wisconsin known only as J.C., who Dibe first emailed on March 14, 2006 using the alias "John Brown." A May 13 email from one of the scammers to Dibe assured the ringleader of potentially rich pickings, gloating that J.C.'s "husband is loaded, there is no doubt about that." Unfortunately for J.C. and her husband, the scammers' confidence wasn't misplaced. On May 18, J.C, agreed to wire the gang $2,750 via Western Union. On July 18, the swindlers convinced J.C. to send $35,000 via bank transfer to "Andrews and Rogers Properties," a Washington Mutual bank account in New York opened by the gang to funnel large wire transfers. Seven days later, J.C. was persuaded to wire an additional $24,000 to the bogus business. Dibe and two others, Bright Amesi and Briceson Loving, were indicted by a federal grand jury in 2009, and arraigned in federal court yesterday, along with Erika Fletcher. Dibe, Amesi and Loving have all been charged with 15 counts of wire fraud, and Fletcher with 10 counts. Seven of the defendants have been arraigned and pleaded not guilty. The charge of conspiracy to commit wire fraud and each count of wire fraud carries a maximum penalty of 20 years in federal prison. The investigation into the 419 scam was initiated by the Treasury Inspector General for Tax Administration (TIGTA), after one of the con artists impersonated an IRS agent in order to convince a victim to pay phony taxes.